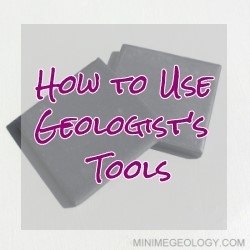 A geologists' tools help them identify rock and minerals, map outcrops and get a close look at their samples. Learn more about how to use a hand lens, streak plates and household items and Mohs Hardness Scale to identify rock and mineral samples. Streak plates are a great to start to determine the identity of your minerals. Many mineral kits from Mini Me Geology include black and white streak plates. This article will teach you how to use the streak plates to perform a proper streak test. Your Mini Me Geology hand lens has two different strengths – 3X and 6X. These hand lenses, included in most Mini Me Geology rock and mineral kits, help you see details on your rocks and minerals. The hardness of a mineral is often used by geologists to help determine the identity of a sample. You can use simple household items and the minerals from your kit to determine the relative hardness of any sample.